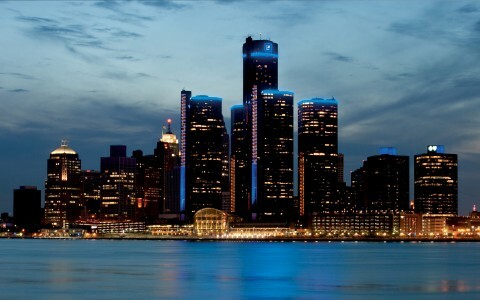 Lighting designers Illuminart used light to heighten the drama in the new atrium at Detroit's Cobo Center. 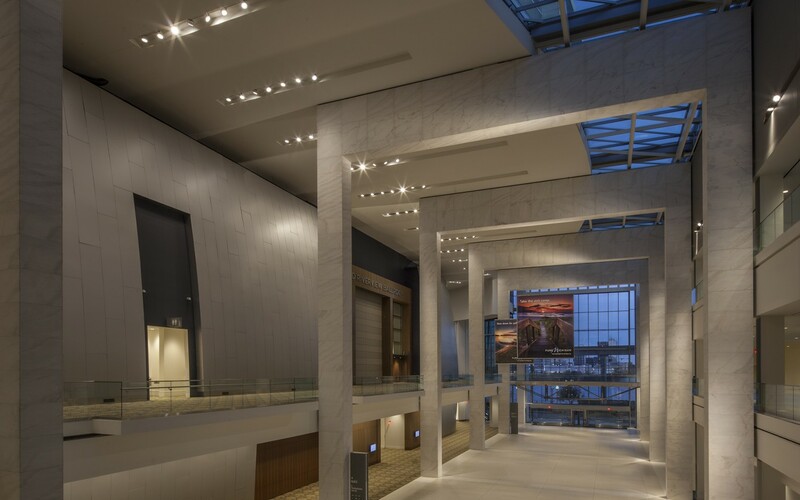 To overcome potential maintenance issues involved with 70’ high ceilings, the firm chose Lumenbeam Large luminaires. 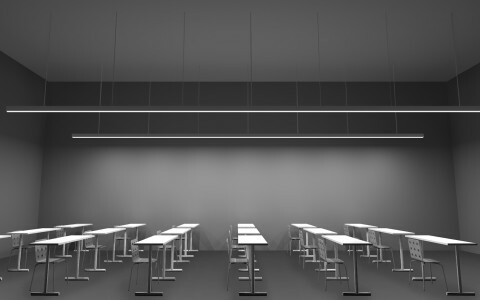 The luminaires are installed in slots on the ceiling and walls. The fixtures are cross-aimed to mimic light coming through the glass atrium during the day. Lumenbeam Large Pendant luminaires were also used in the new ballroom. The luminaires are installed along the perimeter to light the vertical planes around the vast space. Fully dimmable, the luminaires let the ballroom change the look and feel of the space. 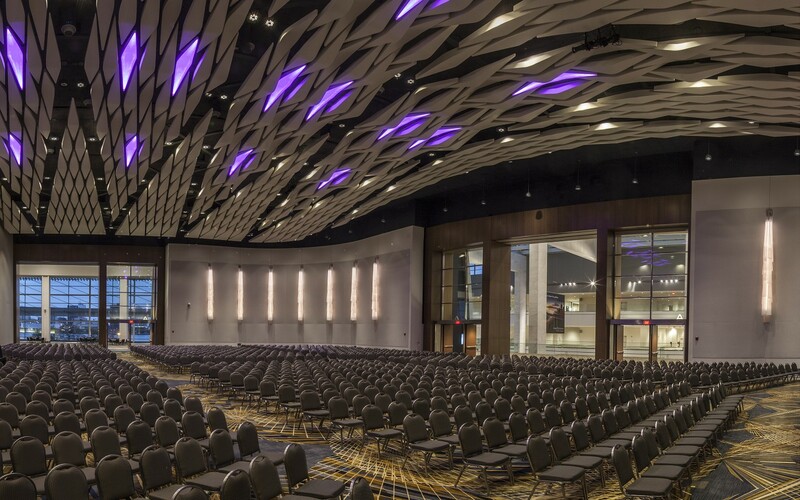 Lighting designers Illuminart used light to heighten the drama in the new atrium and ballroom at the Cobo Center in Detroit, increasing flexibility and easing maintenance concerns. The Lumenbeam fixtures were ideal. We were impressed with their performance, physical quality, dimming range and options. 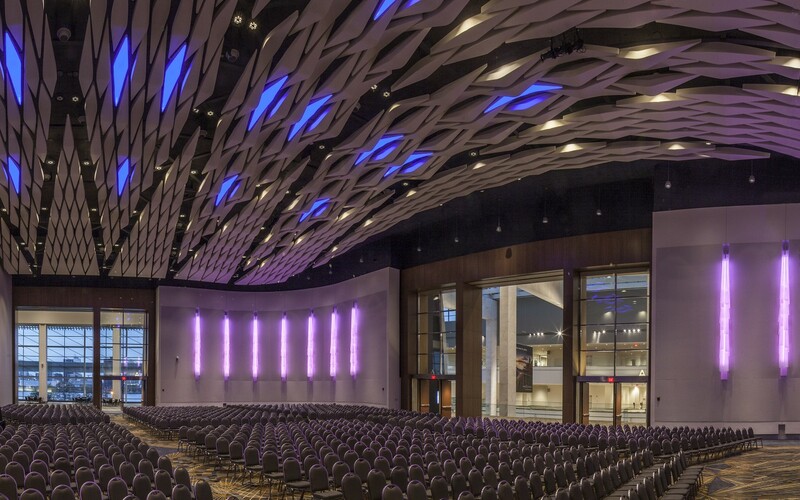 As part of a $300 million expansion at the Cobo Center in Detroit, lighting designers Illuminart were engaged to develop a new lighting scheme that would increase flexibility, ease maintenance concerns, and heighten the drama in the new atrium. 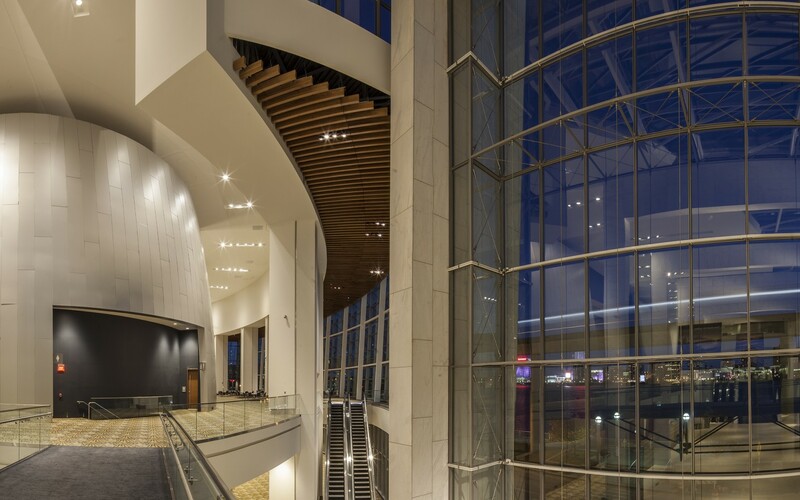 "Conceptually, we wanted to emulate natural light in the atrium, but still focusing on the finishes and the space being lit," said Robert M. White, principal at Illuminart. "The idea was to bounce light off surfaces that bring out the architectural form and materiality, all while keeping the aesthetic impact of the fixtures as unobtrusive as possible," he said. The atrium's daunting 70-foot ceilings, however, posed a challenge. "A few years ago, a ceiling height like that was still an intimidating application for LED technology. So overcoming that hurdle required careful planning on our part," said Brienne Willcock, lighting designer at Illuminart. "But given the scale of the space and potentially expensive re-lamping, the long life of LEDs was perfect. They also provided dimming, better light distribution and glare control, and a high quality of light," she said. 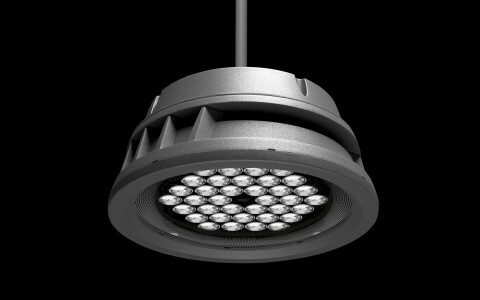 After extensive research, lluminart opted for Lumenbeam Large luminaires in 3000K. Installed in slots in the ceiling and walls, the luminaires perform two tasks: providing ample general lighting while highlighting architectural elements in the space. "Because of the ceiling heights we used spot and narrow flood optics, and they do an outstanding job of delivering light where needed, with the promised candlepower punch and excellent glare and brightness control," White said. 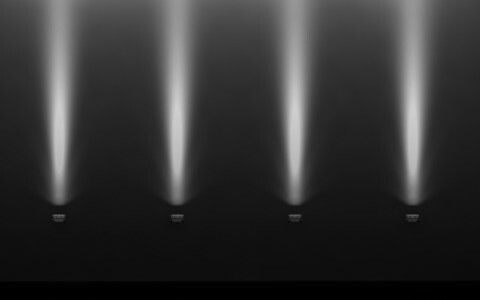 "The Lumenbeam fixtures were ideal. We were impressed with their performance, physical quality, dimming range and options. The yoke mounting, for example, allowed for a 360-degree rotation plus tilt, which gave us a lot more flexibility, and helped get the performance we were looking for," he said. 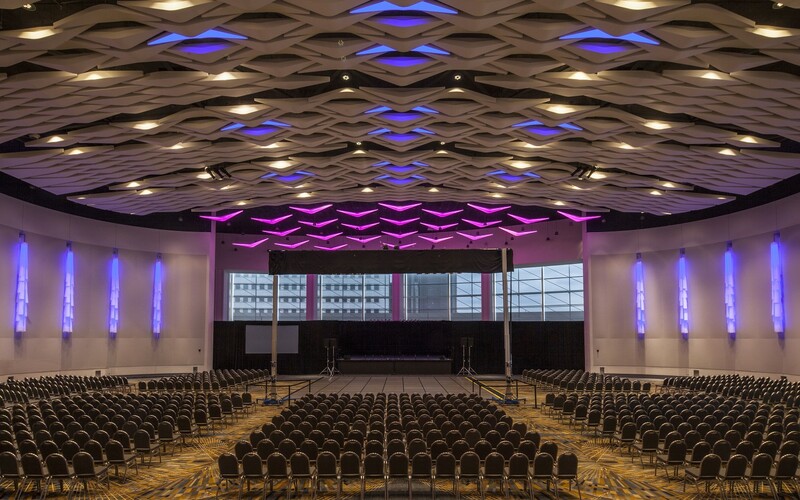 Illuminart were also tasked with finding a solution for the new Cobo Center ballroom, a multifunctional space used for a wide range of events. 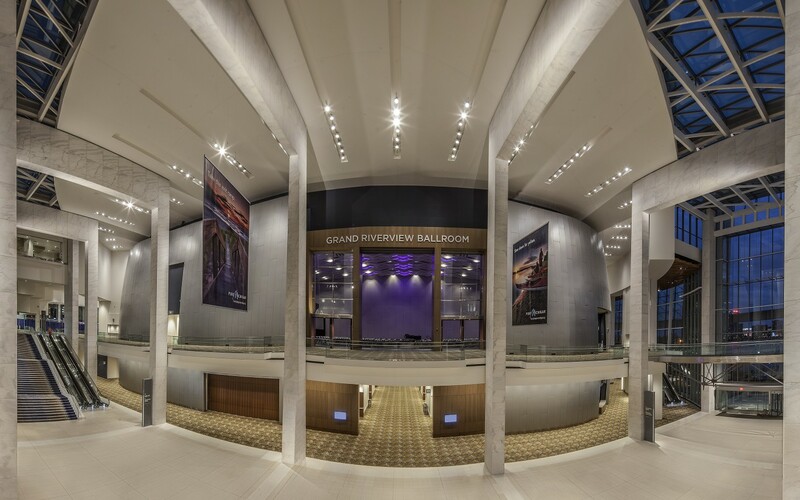 The firm chose Lumenbeam Large Pendant luminaires, installing the fixtures around the perimeter to define surfaces and materials, and to light the vertical planes around the vast ballroom. 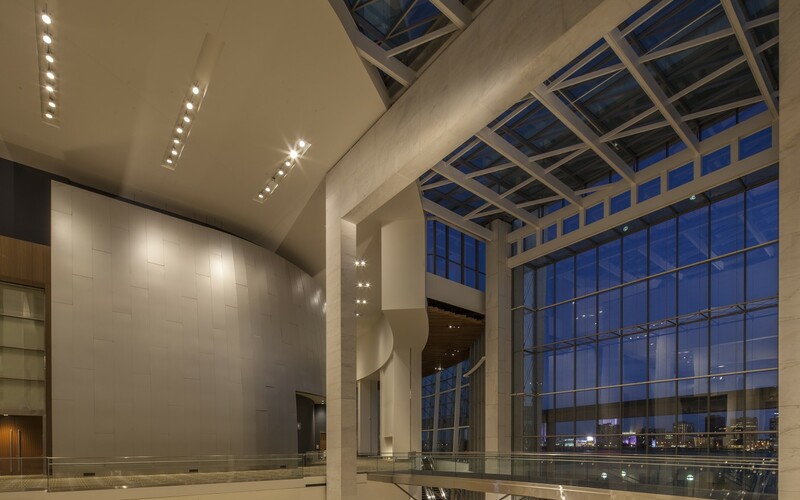 "Even from a 70' height, there is minimal glare with the Lumenbeam fixtures. And since they're dimmable, they give the ballroom adjustable perimeter lighting for the walls and entrances, which helps change the look and feel of the space for different events," Willcock said. 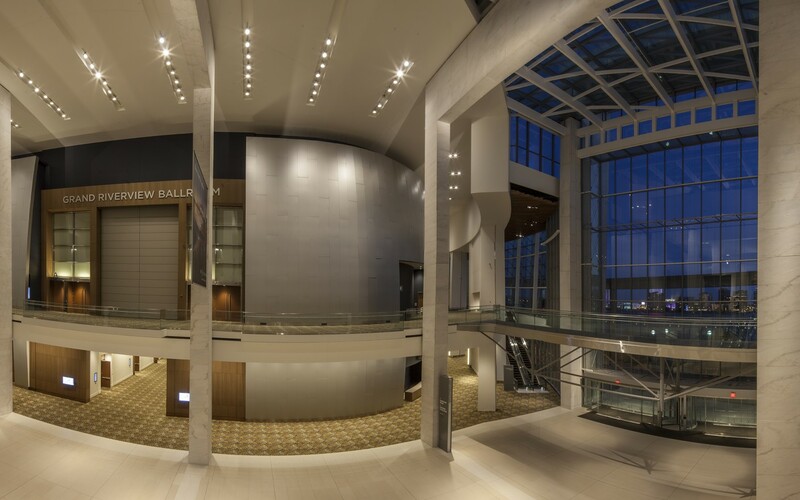 The lighting design of the atrium and ballroom has helped give the rejuvenated Cobo Center a new lease on life, one that augers well for the future of Detroit's waterfront and downtown. Its impact has not gone unnoticed: the project received an Award of Merit from the Illuminating Engineering Society.